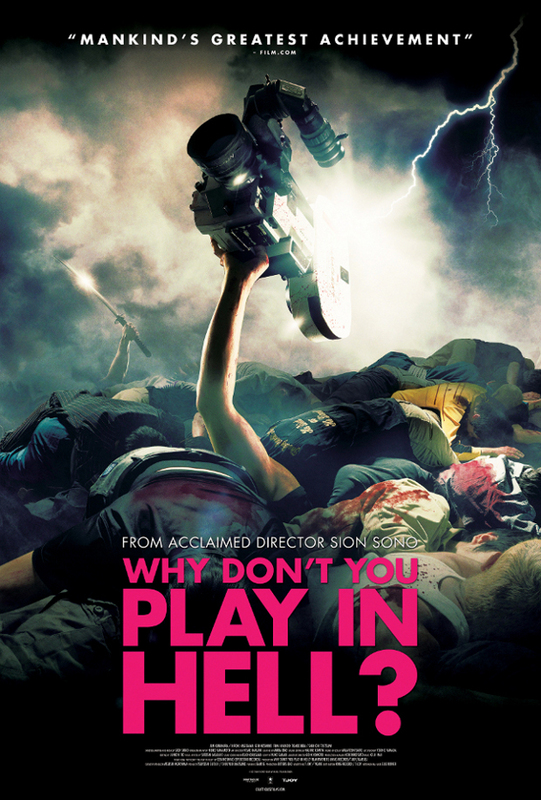 Nothing can prepare you for the awesomeness that is Why Don’t You Play in Hell (2013). But hopefully this review can give you enough of a taste to realise how much you need to see this film. The person who can break down what Why Don’t You Play in Hell is about in a couple of sentences is a far greater writer than I. Probably a far greater writer than just about anyone really. So in the absence of the ability to do the plot justice I’ll just say the following: it is kind of a gangster film; it is definitely a film about film; it is kind of a film about growing up; it is a film about the creative process; it is violent, at times cartoonishly so, at times more realistically and lastly it is utterly absurd. The film reminds me of one of those really absurd Japanese films that you are enraptured with initially, but then the shoddiness of it all overwhelms things. Dead Sushi (2012) springs to mind as a spot on example of that and this is that style of film done so, so right. But the reasons Why Don’t You Play in Hell is an exceptional film and quite how it manages to wrestle with this absurdism that should cause it to fail, but instead allows it to excel is beyond me. Though I do think that part of it is because it is one of the most creative films about film and the filmmaking process I have seen. And as a film buff, I loved that stuff so much. Also, the fact that the tone is not silly and absurd the whole way through I think makes those really over the top parts a little easier to enjoy, because they are snappier and there is some down time in between. I feel pretty comfortable in saying that any real movie buff will love this film, because whilst it is many other things, it is as a film about film that succeeds best. More than simply being about the movies, this is also a homage or lament to film on actual film and an examination of what changing cinema technology means. Through a ‘kids making films’ subplot that smacks nicely of J.J. Abrams Super 8 (2011), the film also examines the struggle of an artistic life and the ultimate triumph of artistic success. There is a real kineticism to the energy of the film from the very get-go, especially in terms of plot and shooting style. There are quieter moments at times, but really the film does not let up. Same goes for the absurdism I have already mentioned. It is there right from the start, with absolute rivers of blood near the start and the strangest standing ovation you’ve ever seen right at the end. The acting is all really good and if nothing else, this is worth watching for the most brilliant Bruce Lee impersonator you are ever likely to see. Related beermovie.net articles for you to check out: SUFF 2014: Suburban Gothic and SUFF 2014: The Animal Condition. It is so, so good. I reckon you would really like this one man. If you don’t you’re dead to me. I’ll give it a shot when I can get my dirty hands on it. It is definitely that. I really want more people to see it, because I am really interested in what other people think of it. Really pumped about this film. The poster caught my eye and now I’m just hearing how insane it is. Good stuff, man! Dude, it is so good. It played at one of the major mainstream film fests out here (MIFF) and people on twitter were just raving about it. So when it played at SUFF, I jumped at the chance to check it out. Would love to hear your thoughts once you have seen it. Hell yeah, dude. Can’t wait to see it. Dude, it is so incredibly good.